change – This Square Peg. Give Me the Panic Attack with a Side of Nervous Breakdown. And a Diet Coke. August 5, 2016 August 5, 2016 Categories Family, Gratitude, Life, Me2 Comments on Give Me the Panic Attack with a Side of Nervous Breakdown. And a Diet Coke. If you’d like to order that particular meal/psychotic break, attempt to clean up Chernobyl your room and simultaneously pack up your life for a move across several states. I started this week. Let’s just say that my mother and sister had to repeatedly tell me to calm down. Like stop from taking a swan dive from your bedroom window level of calm down. It’s overwhelming. 11 years in that room, with an abundance of things to rifle through and pack up and/or trash. Le sigh. If you’re peeking through your trusty psychology manual to determine the emotional subtext behind my mania and stress, I’ll save you the trouble: I simply detest packing. I detest moving things from one place to the other. It makes me nauseous. I’m serious. Don’t ask me where that came from. Likely the same place that drives me to rip off my jewelry. We’re all weirdos. Finding bookworm treasures. To my everlasting glee and giddiness, I found my thought-to-be-lost collection of Lemony Snicket/Daniel Handler’s A Series of Unfortunate Events books. Can I tell you how I delved into these witty, smart, exciting tales of the unfortunate Baudelaire siblings when they were first released? I freely read books meant for the youngsters, by the way, because I love a good story and because they’re almost always well-written. (We’ll talk about my soon-to-be foray into children’s books and YA fiction soon.) Anyway, I thought the original six books were lost forever. And then I found them on Wednesday. So here’s to more book-related treasures I will undoubtedly find as I continue with this breakdown of my room. All to build my bookshelf in TX. Feeling Determined. I have too many things. I’ve acquired too, too many things. Some goals for my move/new apartment include making sure that I have just what I need and no more than that. Here’s to re-reading this blog in a few months when I have a desire to purchase something I certainly don’t need. Feeling Charitable. A lot of things I have are being donated to various charities that can benefit from clothes, shoes, and other items. I already have two contractor bags teeming with items for donation. Here’s to doing something good for someone else, even while I dramatically slide down a wall as I drown in tears. That’s all for now. Told you it was just a few pluses. Anyway, I’ll keep you apprised of the cleaning/packing journey as I go. Pray for me, y’all. August 1, 2016 August 1, 2016 Categories Life, Me, Woman4 Comments on 30 Days. After nearly 30 years of living in Somewheres, VA, in 30 days, I will be moving to the Dallas, Texas area. Since revealing this news to my family and friends, I’ve received responses that range from shock to support/glee/excitement to downright confusion. Here are a few of the most popular questions I’ve gotten, followed by my responses. Why in the world are you moving? Because I’m a human being, an adult, a grown woman, and I have the right to vacate my premises. I’m so happy for you! What inspired your decision? Thank you. Honestly, I’m ready for a change in my life. It really helps that the area I’m headed to is affordable and has a great cost of living, as well as an abundance of jobs. Also, I have personal goals that I’d like to see through and I think being in a less expensive area may assist me in those endeavors. But why Texas? It’s like the Wild West down there. Well, no, it’s not. It’s different from the metropolitan area we live in, sure. But I fell in love with the area when I visited and always had in the back of my mind to move there one day. I think it’s beautiful there and we’ll see what life will be like for me. Won’t you miss your family? Of course I will. I love my family to pieces and pieces. But I’m also pretty excited about this new, impending chapter in my life. For the first time, the idea of moving away isn’t causing the butterflies that permanently reside in my belly to implode. I’m actually OK with this choice, and my family has been nothing but supportive. And if it stinks over there, I’m headed back home without fail. Uh, do you have a job lined up? No, I don’t. I’ll be starting the hunt when I get there. You must have thousands of dollars saved up then. I’ll be staying with a friend temporarily while I look for work. Eventually, when work comes, I’ll get my own living arrangements. I’m terrified for you. Have you seen the news lately? I have. And, honestly, it gives me pause, too. Sadly, however, bad news isn’t relegated to one area of the nation or the world. I can only pray that I stay safe and make good decisions about the places I go and the people I see. Do you have family down there? No, but I have friends who are like family that live down there. This is just really shocking. It is. Change can always be shocking. And you always imagine–at least I do–that people will stay where they are forever. I can’t describe how I’ll miss my friends and family and will miss living in an area where I know the shortcuts to the shortcuts. I’m starting over and without a known tribe around me. But I’ll be ok.
I’m not going to the moon. I’m just some states over. There’s FaceTime, Skype, social media, the phone, and this blog, which won’t change just because I’ve changed my address. If anything, my new life will be healthily updated right here on This Square Peg. It’ll be an entirely new story line of square pegness, actually, in this new area, so we’ll have a lot to talk about. So, yeah. I’m moving. I’m moooooooving! Have you moved before? Whether stateside or to another country? How did you adjust? Details, please, in the comments. This song came up on my shuffle last night while plugging away at the gym, and I was immediately reminded about why it spoke to me so deeply when I first heard it. Ah, this song. Not only that haunting melody and those vocals (those vocals, though), but the lyrics. Are the truth. Are my truths. Banning further ado, here it is, followed by the lyrics, followed by my commentary. To me, the song is about a lot of things. Relationships. Choices. Fear. But singularly, I’m drawn to the aspect of the pursuit of dreams. I’ve never been a go-getter when it comes to certain dreams and goals. By and large, I’ve long believed that what will be will be, and what will come will come. But that doesn’t mean that I don’t taste the proximity of my soon-to-be fulfilled dreams. And this song speaks to that. It reminded me that I may not charge at my dreams like a Pamplonan bull, but I’m moving toward them at my own pace, higher and higher, upward and onward, beyond all I can see. Even when “it feels like I’m stuck forever and ever”, eventually, those dreams and I will meet. As that linked post mentions, I’ll be reflecting on a few fulfilled dreams/changes that are coming to my life in a few short months. Needless to say, we will discuss. Until then, I’ll continue to spend some music-on-repeat time with Goapele and Closer. Tell me: any songs you’re listening to (or still listen to) that speak to you? Like really, really speak to you? May 2, 2016 May 2, 2016 Categories Life, Me, Woman3 Comments on Zones. It’s called a comfort zone for a reason: it’s comfortable. My mom occasionally tells me the following: as a child, she would sit me in a spot and I would obediently stay there. Not fidgeting, not itching to move–glued to where I was placed and never giving cause to worry that I would disappear (unlike my little sister, who often disappeared and returned with fistfuls of food). By and large, when it comes several things in life, I’m still that little girl. When I’m comfortable somewhere or with something, there is very little desire to make changes. Because I’m content where I am. Of course, I don’t have to tell you that this can be both a good and bad thing. On one hand, I’m pleased to remain unmoved by every passing whim or flight of fancy. On the other hand: utter stagnancy. To be stagnant is something I wouldn’t wish on anyone. Not even the girls who introduced me to the word unibrow. Even worse than being stagnant is the precise moment when you realize it, when you feel it: that you’re not moving, you’re not progressing, you’re stuck. Kind of takes your breath away. Several months ago, that realization consumed me. Underneath the contentment I felt with my life was also a complete lack of movement. I wasn’t going anywhere. That sinking feeling also came with a realization that many of the goals that I had, things I wanted to do, had been placed on life’s back burner. I had shelved many of my goals and desires to accommodate my responsibilities to my family, my employer, so on and so forth. But by doing this, I was also being quite faithful to my comfort zone. There’s the sneaky rub: my routine, my existence, was fine, not unpleasant. So why shift the system? Why disturb the force? But I also recognized that in order to turn utter stagnancy on its head, to get moving, to remove from the back burner some of the goals and desires I had, some windows had to open for me. Well, with prayer, time, and keeping my eyes open, I started to feel the light breezes of opened windows all around me. Change is on the horizon for your Square Peg, my dear readers. My pen is poised to begin a brand new chapter, one that will require putting on several pairs of big lady pantaloons and getting my life/goals moving. I’m being intentionally vague with the specifics until things become firmly planted, but once things are set in stone in the coming months, I will speak in detail. Until then, know that I’m intrigued, I’m terrified, and I’m super excited. It’s high time to relegate that comfort zone to life’s back burner, isn’t it? Yes, after making promises to myself that after my cut in January 2014, I would just grow it out patiently and see where it took me, I decided to stop flirting with the idea of a cut (I’ve been thinking about it for a long, long time) and just do it. 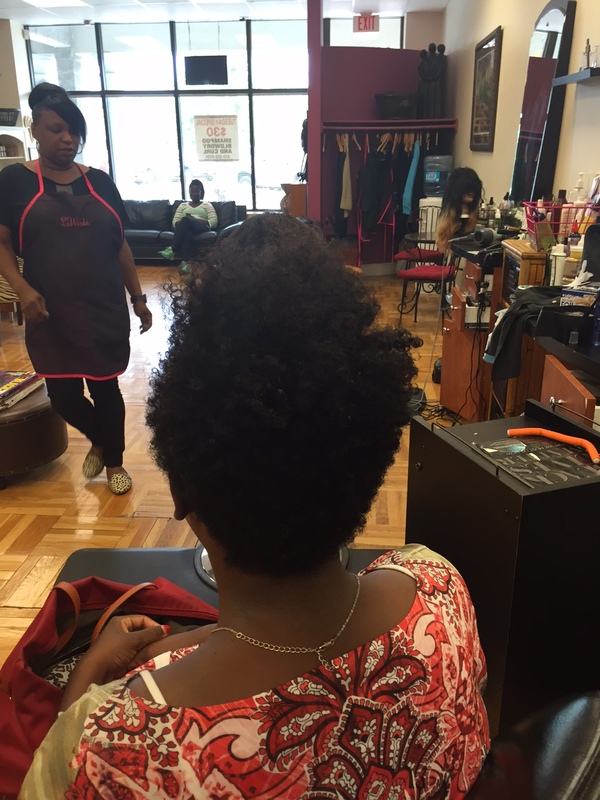 So during my trim and color (went back to black, as you can see) this past weekend, I asked my stylist if we could do a tapered cut. I wanted to retain some length, but I also wanted a shape and a style. Bim bam boom; she snipped, she did her thing, and I love it more than the sliced bread I’m avoiding. 1. As far as color, my formerly red hue was growing and looking old. Rather than spice it back up, I decided to just return to my black hair. 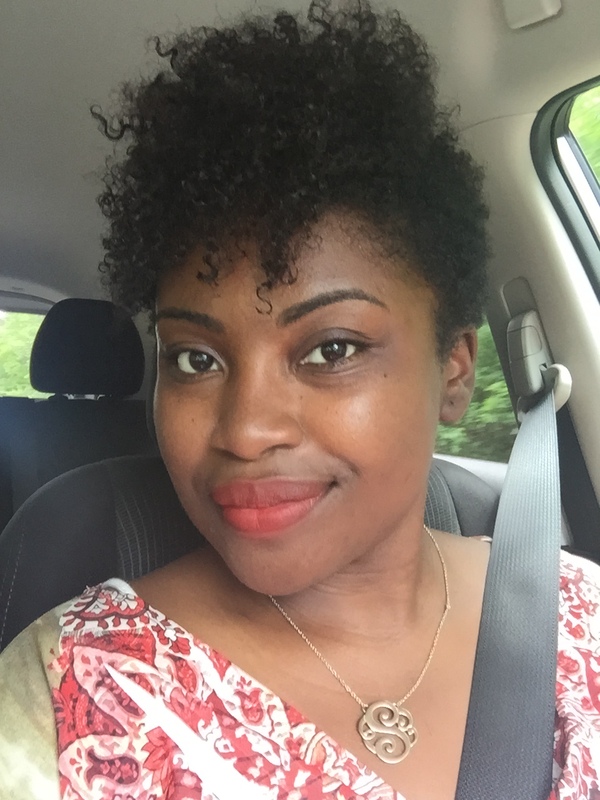 Yes, my gray strands will be popping like crazy soon (I’ve been graying since high school, ya’ll), but whatever. 2. 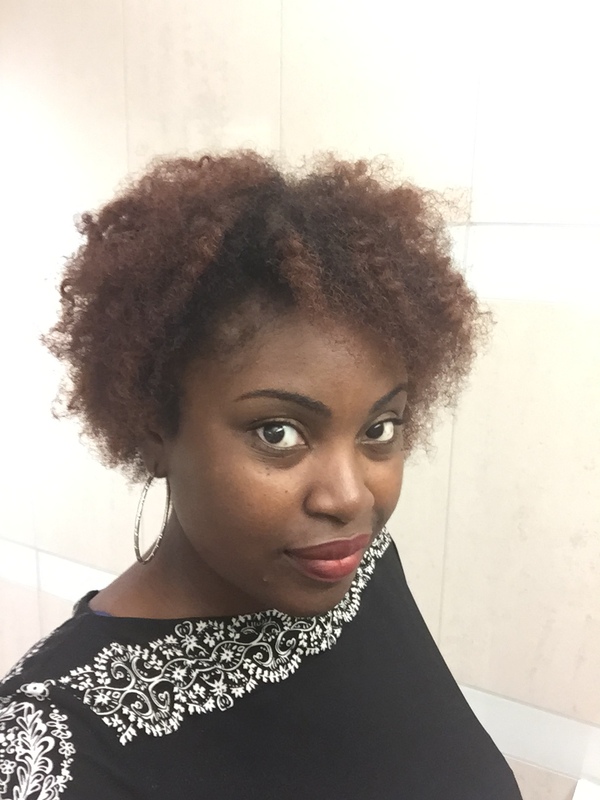 Honestly, as much as I love twist-outs and Bantu knots and all of that, I kind of wanted a quicker way to style my hair. 3. 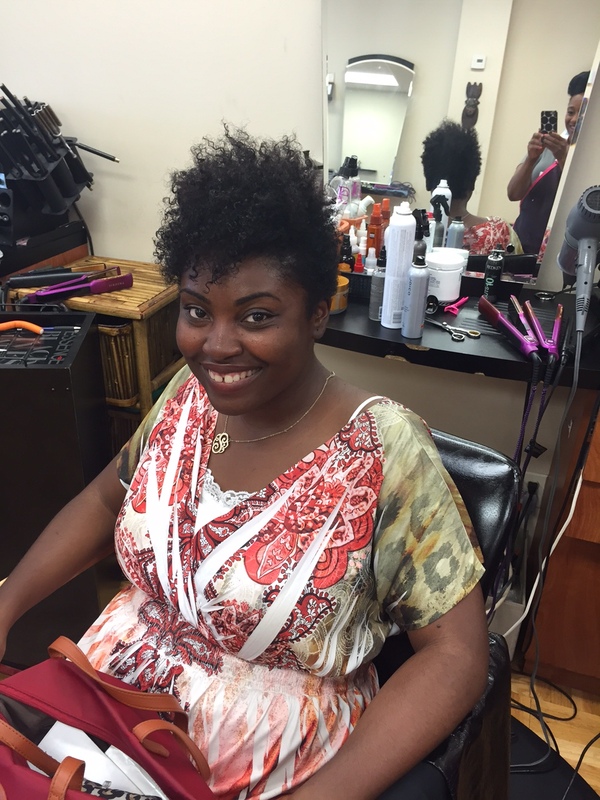 Tapered ‘dos are super chic! 4. It’s summer. Enough said. 5. Red lippies (which you know I love) pop like crazy with dark hair. Are you wondering if I’ll keep this look when summer ends, though? I am, as well. It’s something to think about. I really love the look. Which means I might keep it longer than these hot days. Growing out my hair was my initial goal when I big chopped, but I have to tell you that I’m a sucker for chic and quick. And whether long or short, I just want healthy hair. Let’s talk about that for a minute. 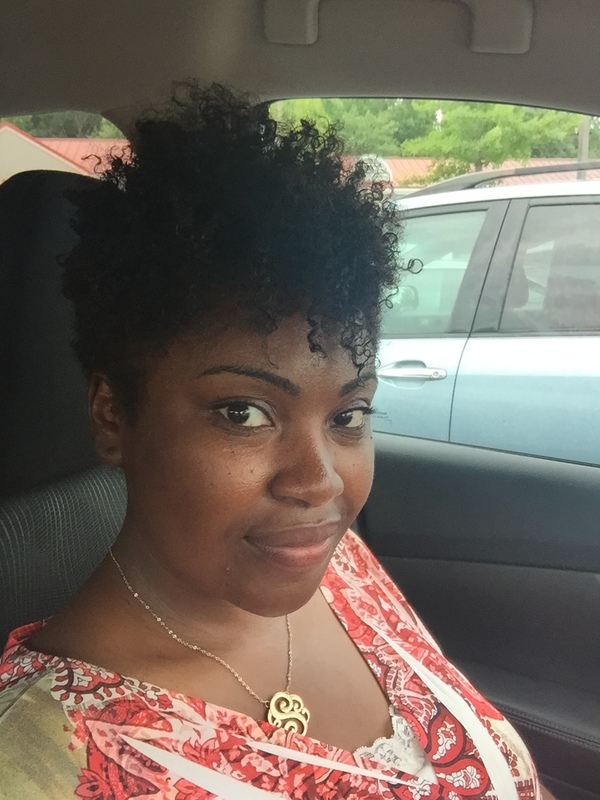 Along the way in this fun, discovery naturalista journey, my hair changed. There was some breakage, some damage. Deciding to color it certainly didn’t help. So I think it was high time I cut it, not only for a style and a shape, but to kind of start over. So whether or not I grow it back out or retain this look, the change was necessary. We’ll see what happens. For now, I am incredibly pleased with this change. My mother didn’t faint, by the way. She was very happy with the change, probably because I mentioned that I’m done coloring my hair. And she’s used to her oldest change fomenting change by way of hair, so there’s that. You like? What summer changes are you up to?